If you've been in the UAE long enough, you've definitely experienced iftar/suhoor in hotels and or cafes. The iftar/suhoor tents are decked, the spread is lavish and the ambience is laced with the conventional Ramadan vibe. 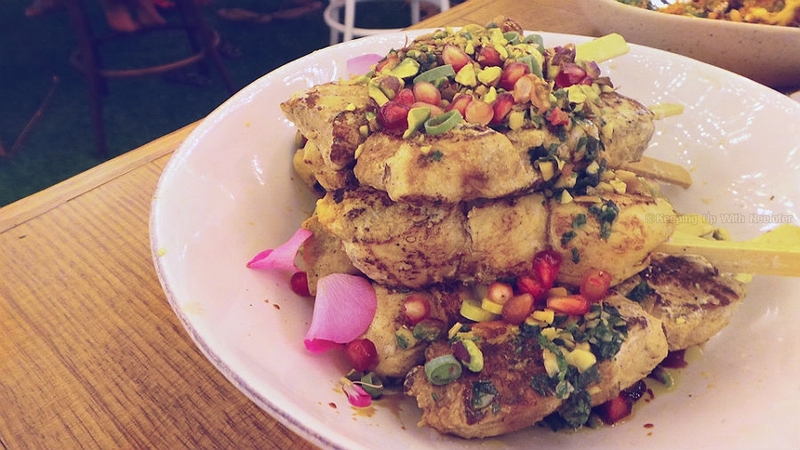 Arabic cuisine is the common thread across venues hosting iftar and suhoor tents. You will find a bit of international cuisine thrown into the mix as well but that's about it. The buffet gives you the option to eat at your will and you really can't miss the desserts station. Ask anyone and they will tell you the tents have evolved into glamorous ones and it almost feels like you are experiencing an Emarati wedding (you'll know what I mean if you've been to one). That's how iftar/suhoor is however, Dubai is a city that has established itself in doing things differently and with much success. There's one particular venue that checks off all the boxes when it comes to a unique iftar proposition. 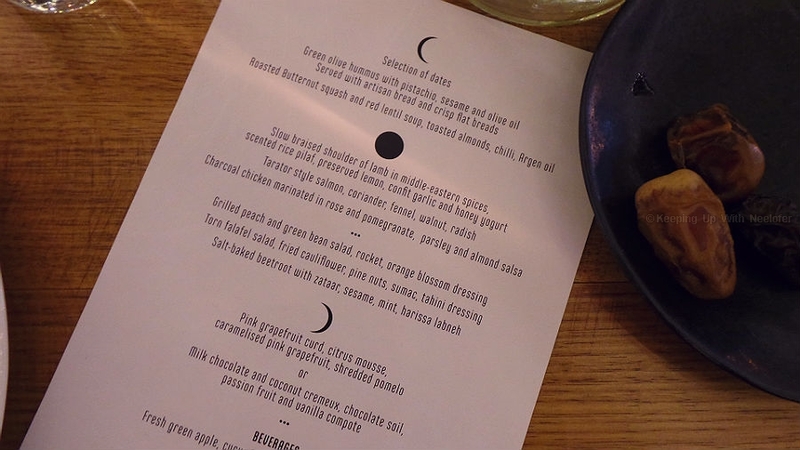 It's an iftar pop-up that furnishes different dishes from a menu that will leave you raving about the food. Ramadan Nights by Dish is an alternative iftar venue located at Warehouse Four, Al Quoz. Featuring dishes inspired by recipes across the Middle East, the venue, ambience and food will take you on a surprisingly pleasant gastronomic journey. The venue is visually pleasing and focuses on a Moroccon themed seating (there's also the standard seating if you prefer that). We broke our fast with a flavorsome soup, the Roasted Butternut squash with red lentil soup, toasted almonds, chilli and argan oil. I'm used to the standard tomato or lentil soup, so this was a delightful surprise. 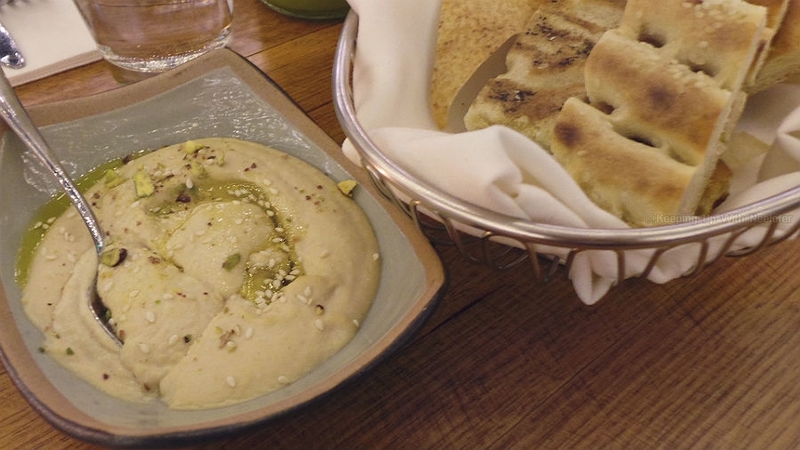 Hummus is the backbone of several Arab households. We all know how much beetroot hummus made noise in the food industry with almost every restaurant serving it. We were presented with a unique Green Hummus concocted leveraging fresh olives, pistachio and sesame seeds, topped with spoonfuls of olive oil. It was refreshing to consume this with the bread. 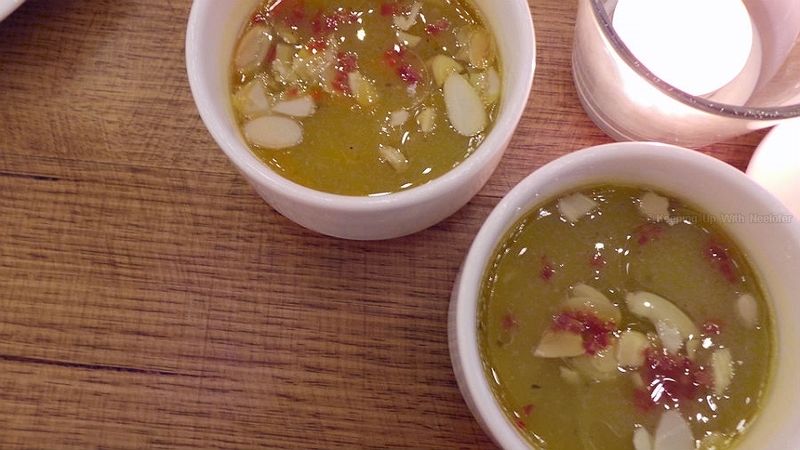 Smooth, creamy and the crunch of pistachios made this an interesting appetizer. What came next were three varieties of salads (my favorite! 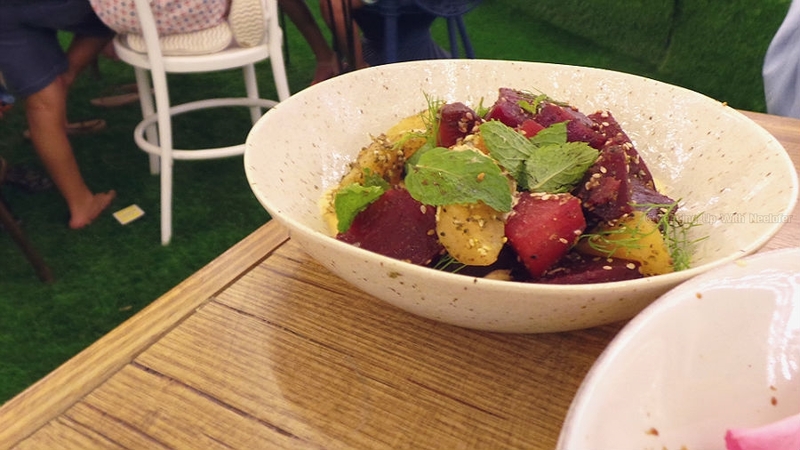 )- the Salt Baked Beetroot salad with zaatar, sesame, mint and harissa labneh, the Grilled Peach and Green Bean Salad with rocket and orange blossom dressing and the Torn Falafel Salad with Fried Cauliflower, pine nuts, sumac, served with tahini dressing. I loved all three as each boasted of a distinctively rich flavor and taste. I eat salads almost every day and haven't come across these. I do wish I could order salads from Dish every now and then! I loved how the beetroot tasted with zaatar and the harissa labneh. 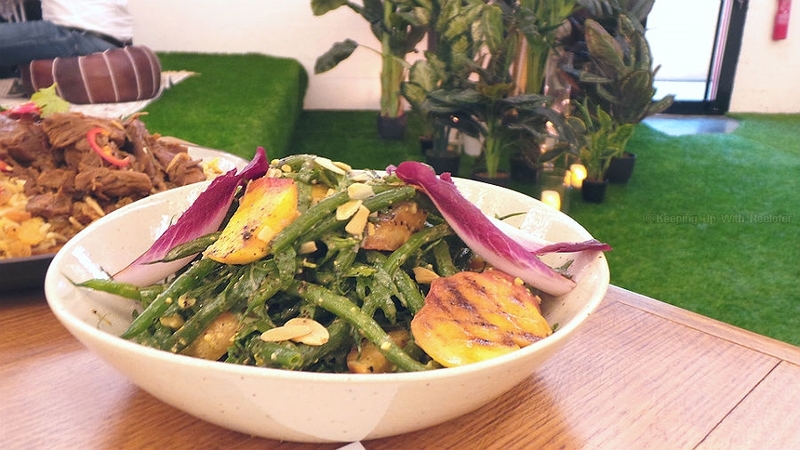 The grilled peach added a slightly sweet yet delicious taste to the bed of green beans. Don't dismiss this salad just because it has fruit. The torn falafel with fried cauliflower salad was fulfilling and checked off all the boxes when it came to ingredients, texture and taste. I must try and replicate this at home. While still savoring the taste of the unique salad, the main course made its way to the table. And what a delight it turned out to be. First up was the Tarator Style Salmon with coriander, fennel, walnut and radish. Let's talk about the presentation- visually appealing and so strikingly beautiful, it makes me appreciate the chef even more. While I'm not a fan of seafood, I had to sink my teeth into the perfectly looking salmon. After the first bite, you immediately the taste the smoky flavor whilst the medley of coriander and fennel strike a balance. The salmon was cooked to perfection and the delicious toppings of the Tarator sauce made this a palatable dish. I don't usually praise seafood as much (for obvious reasons) as I do with salmon dishes and this one is a pretty close favorite. 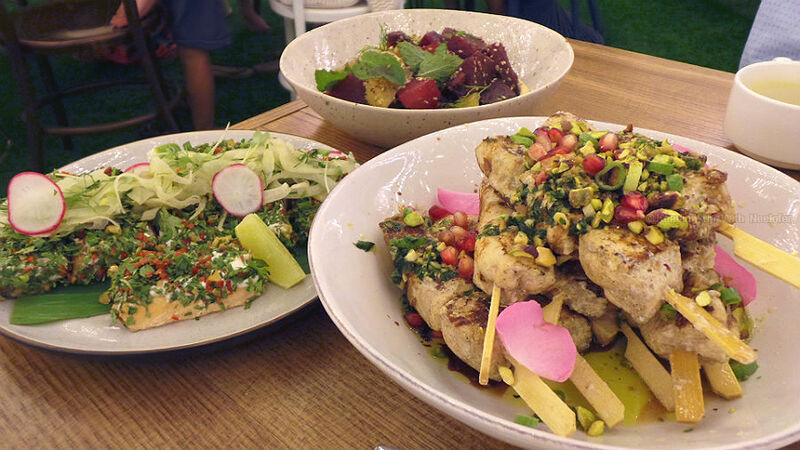 If you aren't too keen on seafood for iftar (the salmon wasn't heavy at all, infact it was the perfect serving), then you must try the Charcoal Chicken marinated in rose and pomegranate, parsley and almond salsa. Everything that I love is in this dish. 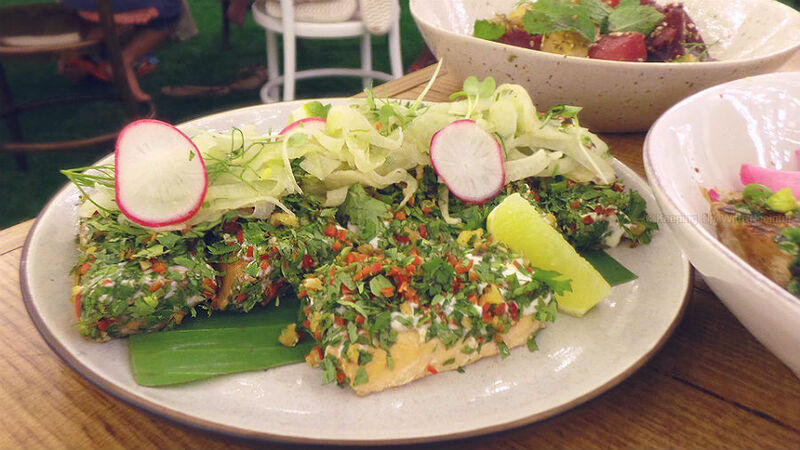 The tender, mild flavored chicken against the flavors of parsley and almond salsa made this the star of the iftar. I loved how unique this dish was; the addition of almond salsa to the charcoal chicken is unheard of but quite delectable. 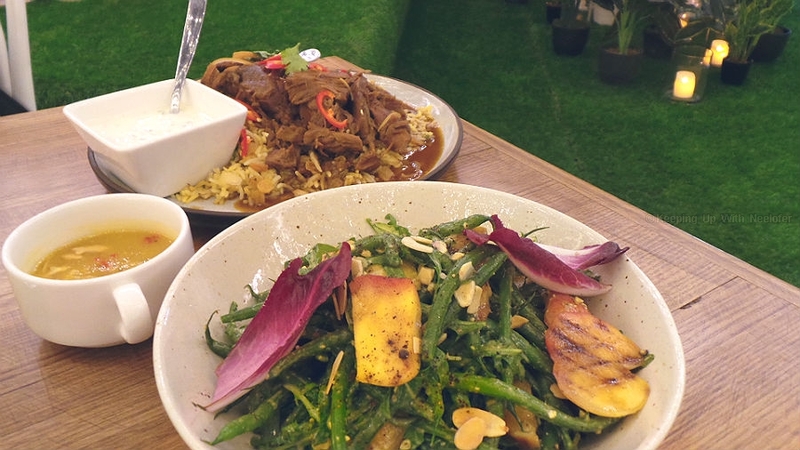 The final dish from the main course is an Emarati favorite, the Slow Braised Shoulder of Lamb in Middle Eastern spices served with scented pilaf rice, preserved lemon, confit garlic and honey yogurt. While the lamb was succulent and richly seasoned with the spices, the rice pilaf was incredibly delicious as it compounded the medley of flavors. This meal is perfect for lamb lovers and Gordon Ramsay would be proud. Meals without desserts are like cakes without icing. I have a sweet tooth and when I visit any restaurant or cafe, I'm usually spotted viewing the desserts menu first before the savory. 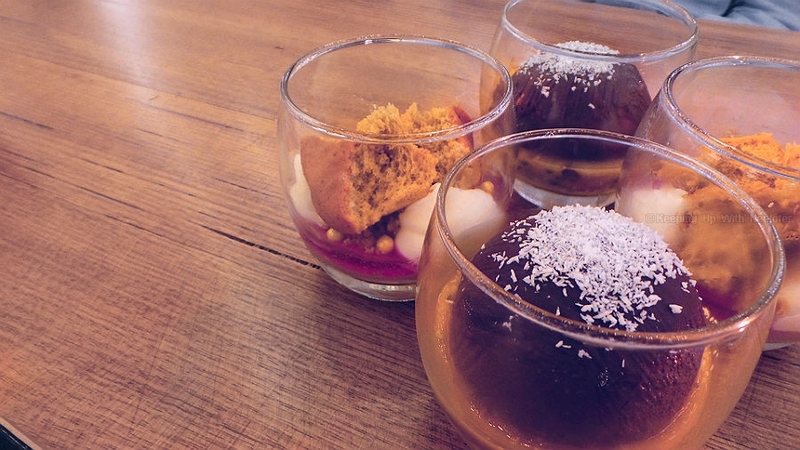 At Ramadan Nights, we were served with two kinds of desserts. For the ones who gravitate towards fruit based confections, try the Pink Grapefruit Curd atop a bed of smooth and creamy citrus mousse served with caramelised pink grapefruit and shredded pomelo. 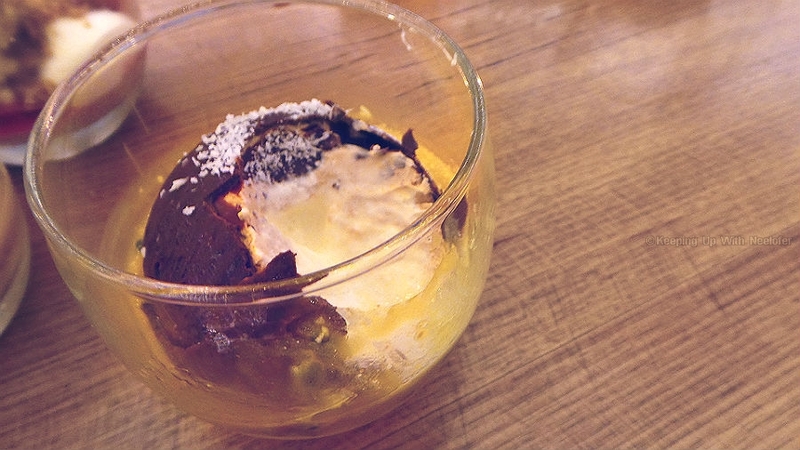 Loved how the flavors did not overpower each other; quite a divine dessert this turned out to be. 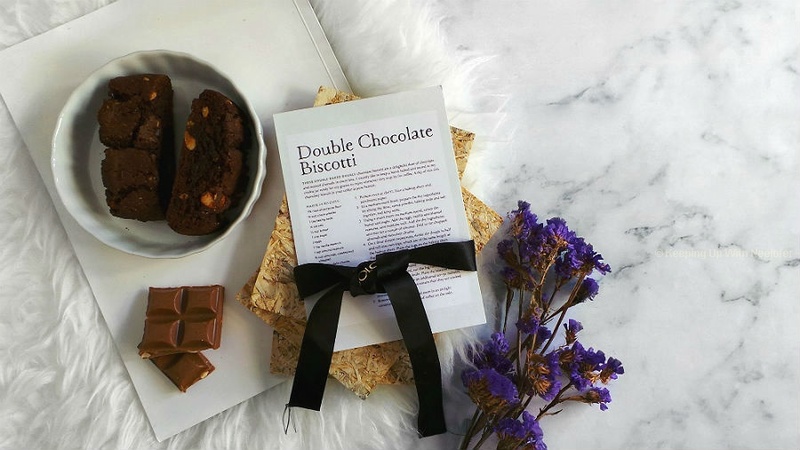 For chocolate lovers like myself, the perfect dessert comes in the form of Milk Chocolate and Coconut Cremeux that encapsulates a creamy vanilla compote whilst resting on a buttery, rich chocolate soil (brownie). The fresh passion fruit pulp adds a burst of sweet and sour flavor to this dessert. I love the fact that the iftar menu is quite unique and the serving sizes per person is perfect. Many a times, post iftar a lot of people feel awfully sluggish and that's due to the food that's consumed. The meals at Ramadan Nights were light yet satisfying. Ramadan Nights by Dish Catering is perfect for a unique culinary iftar experience and one you definitely can't miss. The price point is fair (AED 195 per person), food delicious, service amicable and the venue is void of parking hassles. This has my seal of approval and I give it 4/5 stars (it would've aced the ratings if there was at least one Arabic dessert on the menu). Ramadan Nights hosted by Dish is on until the end of Ramadan 2017 and is located at Warehouse Four, Al Quoz (use Google Maps to get there with ease). A reservation is mandatory and the venue is open from sunset until 9.30pm. Call 056 - 128 32 47 or drop them a line on info@dish.ae for bookings.